Only you can apply the brakes to slow down the Courthouse Timber Sale and get everyone to take a closer look. This sale – scheduled for nearly 500 acres in the Pisgah National Forest near the foot of Devils Courthouse – has been through the various assessment channels including NEPA (National Environmental Policy Act) and is now open to public comment. I believe “the last five or 10 years” Gale was talking about was the Forest Service’s move to stewardship contracting – a way of doing business with the long-term goal being the creation of healthiest possible forest ecosystem. See http://smokymountainnews.com/archives/item/3072-logging-for-cash-versus-long-range-forest-health for and outline of stewardship contracting. For me, personally, there is a lot disconcerting about this proposal. The idea of a large scale timber cut that would open the understory while at the same time provide money to help stop the march of exotic invasives seems at cross-purposes to me. I don’t believe even Forest Service botanists would deny that clearings are the biggest spreaders of exotic species in a forested community. I also wonder at the mention of golden-winged warbler. It seems that anytime there is forest treatment mentioned in the Southern Appalachian Mountains it will be of great benefit to golden-winged warblers. Strange how the creation of early-succession habitat for game species like ruffed grouse and white-tailed deer are conveniently omitted. 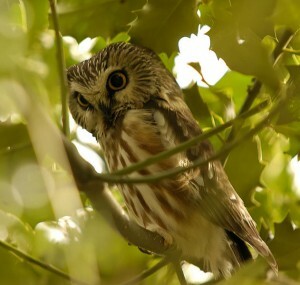 What happens to northern saw-whet owls, cerulean warblers, worm-eating warblers and Acadian flycatchers (also high priority species) when you demolish their habitat? This looks suspiciously like a for-profit enterprise with eyes (better roads, better culverts, more oak and hickory) towards even more profit in the future. If you believe this is a project that needs more light and explanation let the Forest Service know at comments-southern-north-carolina-pisgah-pisgah@fs.fed.us (please put Courthouse Project in the subject line, or by mailing comments to Dereck Ibarguen, District Ranger 1600 Pisgah Highway, Pisgah Forest, Nc 28786.